I hope you are preparing yourself for this weekend's general San Diego Comic Con sale. If you haven't created your official Comic Con ID, I think you are already out of the game. In an event that is sure to fill your social media feed with complaints and tales of victory, I wish my fellow nerds the best of luck as they try for the coveted golden ticket. Good luck all! Huck #4 - Holy twist, Mark Millar! Huck is the only superhero that is even more of a goody-goody than Superman and Captain America combined and his story has been one of the most endearing I have read in recent memory. Thanks to his powers going public, Huck has reconnected with his brother and has learned that his mom escaped from the Russians during the Cold War. Using his special abilities, Huck is on the trail of his mother, but being the good Samaritan he is, he is delayed in his efforts to help others along the way. This title needs to be developed into a television series or movie so that this story can reach the masses. This is the issue that cements it as a must read. Birthright #14 - The tension between Mikey and Brennan reaches a boiling point in an emotional issue that is setting up an epic ending to the current arc. Brennan finally has had enough and stands up for himself in a series of panels that I can relate to as a younger brother. It is amazing to think about how composed he has been considering what his family has been through. This was the issue that humanized Brennan and Mikey's relationship and Joshua Williamson should be applauded for doing so in such a realistic fashion. Add in the drama that breaks at the end of the issue with their parents and we are fully set up for a truly special ending of this arc in the next issue. 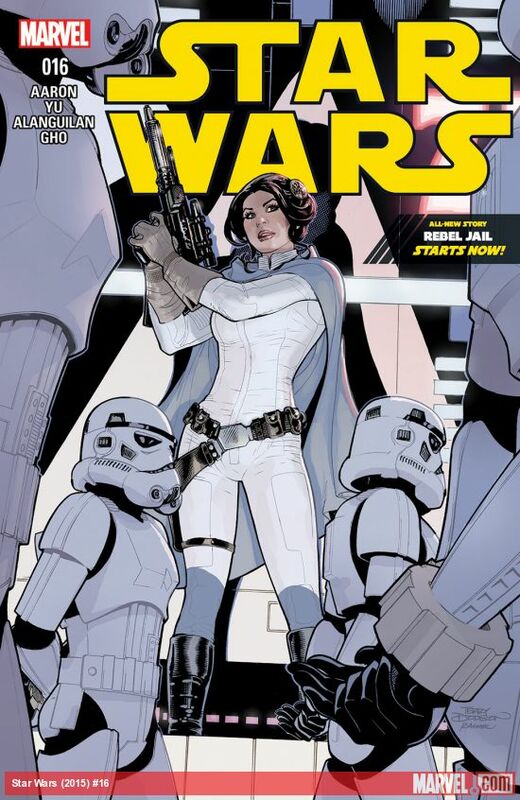 Star Wars #16 - Dr. Aphra has just been secured in a secret rebel prison that exists on a star. Leia is ensured that this is a secure location, but Aphra reminds the prison that she is a friend of Vader and that she won't remain long on this star. Meanwhile, Han Solo is gambling with funds that were intended for supplies and may be a bit rusty on his act. The Marvel take on Star Wars continues to shine as it sheds light on events that took place between the movies. I am curious to see where Solo's failed gambling brings him and Luke as they attempt to strengthen their tie to the rebellion. It is easy to think they were always a key part, but both of them fell into their roles and their struggle to fit in is an enjoyable read.